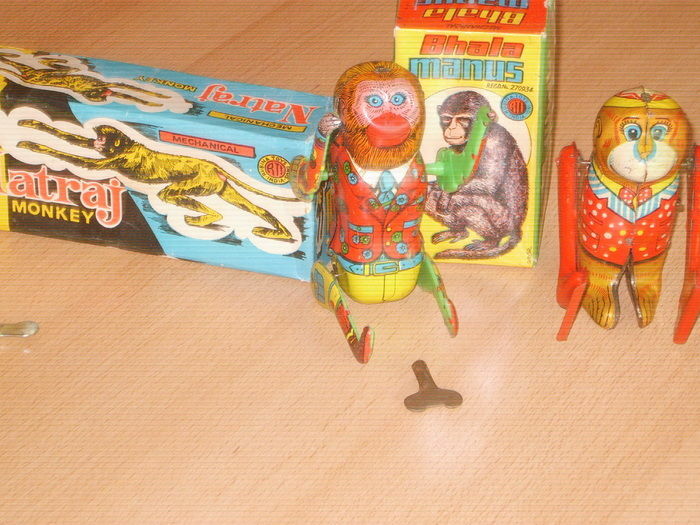 The 2 tin monkeys are made in the 70s of the last century by Rubina Toys from India. 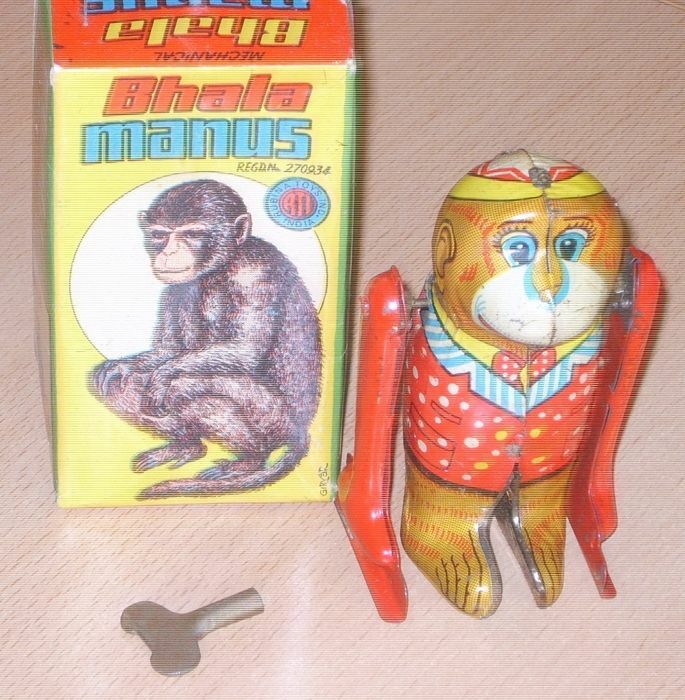 Once the key is turning the arms (and legs) of the monkey also turn. 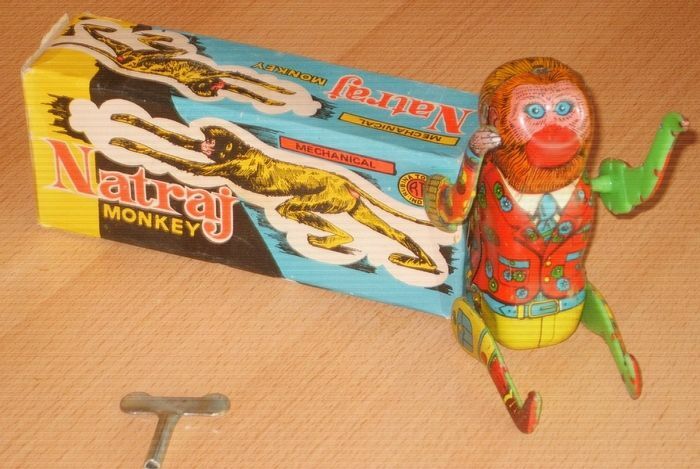 Both monkeys are in the possession of the original box and key. 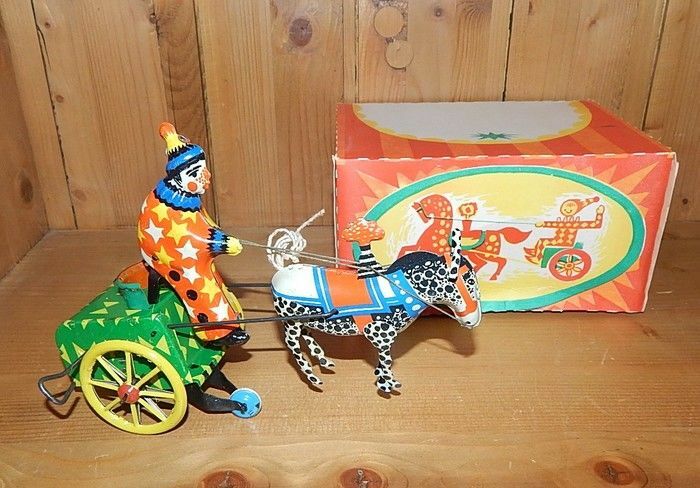 The famous tin Circus Clown with horse and cart was made by Lehmann in Germany for years. 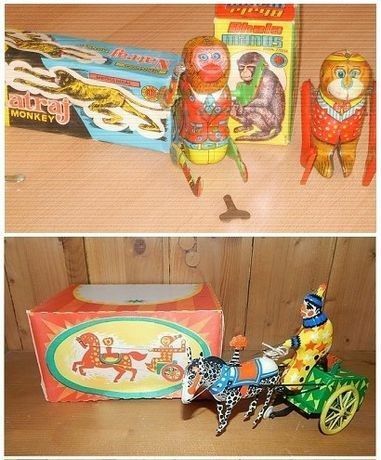 The beautiful item is also made in USSR in the 1970s. 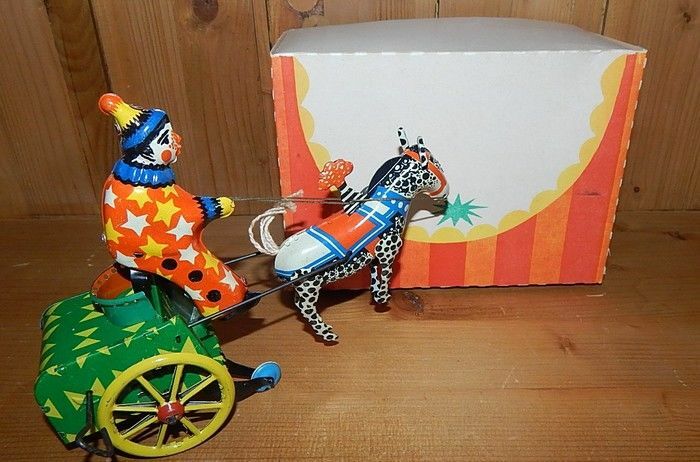 This copy is in new condition and complete with key and original box. You can always mail us for additional information. Will be sturdily packaged and shipped by registered mail. Oggetti stupendi e ben confezionati. Netjes ingepakt en prima staat. Excellent clock in beautiful condition. Very quick delivery with lots of protection for clock. I would recommend this Selle based on my personal experience. Mooie kwaliteit en super snel geleverd, heel erg bedankt! 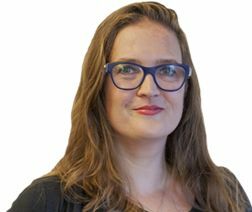 Zeer netjes verpakt, snelle bezorging. Ben heel blij met dit kavel. El pedido se corresponde con lo ofertado. Perfectamente empaquetado. Satisfecho con mi compra. Gute Kommunikation und kulante Schadenfallabwicklung. Anbieter kann weiter empfohlen werden. Alles in orde, goed verpakt, snel geleverd. The watch is not in a good condition at all... and the watch is dirty ! In the description clearly states that the item is not new. But why first a negative feedback and then ask for a solution ? Hansje integraal beschadigd en durft zelfs te beweren dat het zijn album niet is ! GE MOET HET MAAR DURVEN ! Zwakke doos waar de boeken net in pasten En nog liegen in reactie op feedback erbij ! Great seller and would buy again. 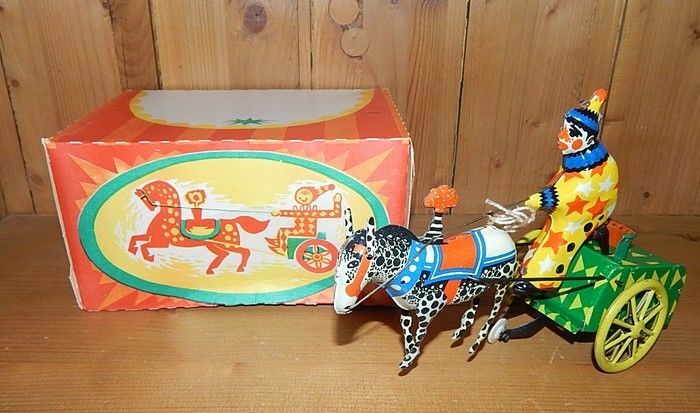 This was my second purchase from this seller and great experience. 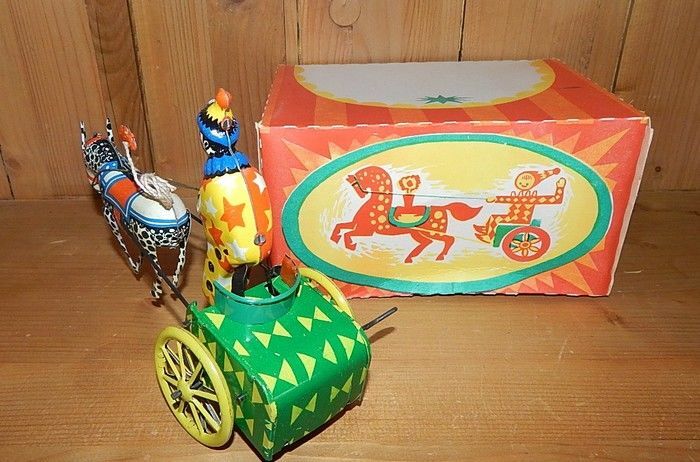 You can pick up this lot from the seller: Almelo (Overijssel), Netherlands.